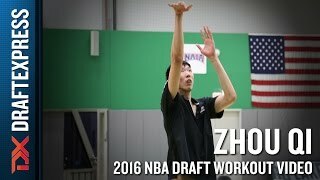 Chinese big man Zhou Qi goes around the key in a Nike Hoop Summit shooting drill. Zhou Qi sat out for the second straight day due to an ankle injury he suffered at the conclusion of the first day's practice. While many scouts are enamored with the length, high skill-level and excellent timing as a shot-blocker of the 7-2 Chinese big man, his incredibly frail 209 pound frame is a huge concern, and the injury Qi suffered so early in the week did nothing to dispel that. -One of the tallest players measured at the Hoop Summit all-time, Qi's wingspan ranks among the 25 longest in our extensive database. He ties for the longest hands of any player on the World Team with George Lucas. His 209-pound frame remains the biggest question-mark regarding his NBA potential as he is painfully skinny at this stage and has a narrow frame that might not have great potential for growth. John Henson (7-5 wingspan, 9-4 standing reach, 216 pounds) seems to be the best body comp we can find for Qi, even if the Chinese big man towers over him at 7-2 (Henson is 6-10 ½ in shoes). -Extremely frail. How much will his body fill out? Outlook: One of the most talented international prospects in the 1996 class. Extremely gifted 7-footer with tremendous versatility and an advanced offensive game for his age. Shows good timing defensively. Very productive at the junior level. Mental makeup is a bit of a question mark. Doesn't show great passion for the game. Sometimes looks like he's playing because he's tall and talented, not because he enjoys it. Still extremely young both age-wise and physically, so has plenty of time to continue to develop.